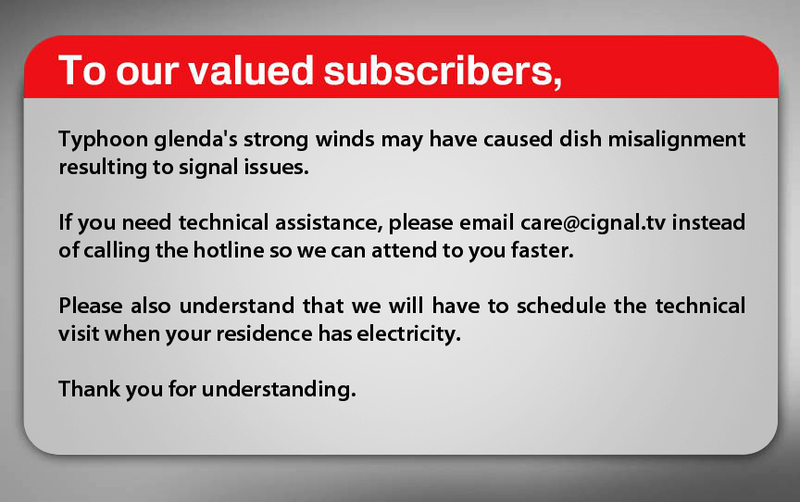 So, are you one of CignalTV subscribers who have experienced down time due to the recent typhoon Glenda? You already emailed, texted, or called and yet there is still no help? Here's what you can do. Contact a technician who is knowledgeable with satellite dish TV types (with or without digital cable box). If your CignalTV was installed by an authorized dealer, chances are, they have technicians who can assist you with a minimal fee (Php300 to Php500). If the issue involves adjusting a misaligned dish only, then you're lucky. But if it requires replacing the dish, you will really have to wait for CignalTV's assistance. But no one knows when will that be. When you call their hotline, you will immediately hear a recording recommending you to email instead of calling in order to be assisted right away. My email, dated July 18, was never replied to till this day. I also called multiple times since the day after the typhoon (July 16), waited amidst the long wait time, and heard the same script each time. I doubt if the job orders are on a first come first serve basis because I'm sure we were one of the first to call yet no tech ever called for an appointment. The repair assistance isn't systematic either. It would have been better to send repairs per area. In this village alone, there are numerous CignalTV subscribers yet no technical help was provided as a whole. A neighbor, who saw the tech fixing our dish, approached the guy and asked for help. The installer/technician can only do as much. He can only aid those who contacts him. It was only one after full week without cable TV that I recalled what the technician who installed our satellite dish said. He asked us to contact him in case we run into any technical trouble with our service. It was as if he anticipated future troubles with this cable. Good thing, we started with this service only last summer and my husband doesn't erase text messages. The tech's phone number and text messages were saved so we were able to contact him and setup an appointment. He was able to fix everything in only a matter of minutes time when he came over. If you head over to CignalTV's Facebook page, you'll still find several subscribers complaining that they still have no service or no one had contacted them for repair appointment. For those who have been attended to at least, the repair was free of charge. But I won't wait that long next time. I'd rather pay than wait for God knows when.